While busy with social engagements on Lily’s behalf, and worrying if Reggie really *was *murdered, Frances learns of mysterious burglaries plaguing London’s elite. The investigation brings death to her doorstep, and Frances rallies her wits, a circle of gossips, and the ever-chivalrous Mr. Hazelton to uncover the truth. A killer is in their midst, perhaps even among her sister’s suitors. And Frances must unmask the villain before Lily’s season—and their lives—come to a most unseemly end . 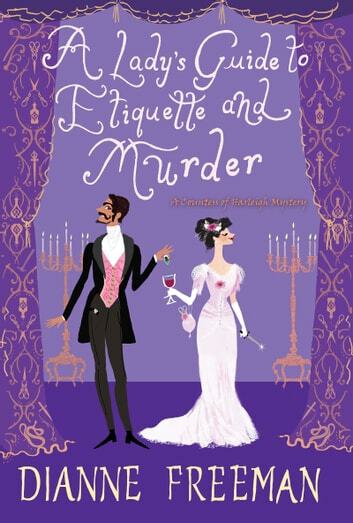 . .
A Lady’s Guide to Etiquette and Murder is a cozy mystery about a widowed Lady who is trying to live her newly independent life, away from her in-laws who want her money, and also is sponsoring her younger sister for the debutante season. Basically, she has her hands full, but the fact is that her husband’s death may not have been a murder, her brother-in-law is contesting rights to her fortune, there is a new thief lurking in high society and the big task of keeping her sister away from the wrong kind of grooms, are all interrupting her new life. While the book is passably good as a mystery, it still leaves a lot to be desired in plot development. The writing tends to go over more description and exposition than needed, and Frances describing her every day life in minute detail is unnecessary, as it feels more like a teen diary than a mystery novel. There was also quite a lot of repetition, as characters would keep getting filled in and then they all would sit together and try to go over the clues. The characterization feels more natural, like novels actually written in that era (think Austen’s characterization) so that is a good thing, depending on how you like it. It also has little bursts of humor and the overall mood is light; there are not high stakes, but the consequences could be life-threatening at times. Romance is mild – like we know that George is going to be endgame, but we can wait for further books for Frances to want to get into another marriage. Ultimately, though, while the plot is good, the writing is what sort of ruined the enjoyment for me. But if you like light mysteries, it might be the book for you. A year after losing a husband etiquette states you leave off your mourning. In A Lady’s Guide To Etiquette And Murder, Frances Wynn is more than ready to put aside her mourning. It is bad enough that she is only 27, but the fact that her husband had died in the bed of his mistress made moving on just that little easier. Finally, she is able to escape the money pit which is the family estate and look forward to taking up residence in her new London townhouse. One bright light on her horizon is a visit from her sister Lily. She has been sent from America by their parents so Frances can bring her out in London. A whirlwind of engagements and shopping ensues. But with the new beginning, and her sister’s social whorl comes unexpected complications. Someone has sent an anonymous letter accusing Frances of murdering her husband. While she did not kill her husband, she certainly doesn’t want the police to find out about the real circumstances surrounding her husband’s death. With that, someone is burglarizing exclusive London parties and the burglar just may be one of her sister’s suitors. Exciting, Different, And Fun This is not your typical mystery nor your typical Victorian romance. I really like how it is a complete departure from what you would expect. The main character is reluctant in the extreme to have to investigate the mysteries going on around her. This is not typical for your average mystery novel. Frances is a very resourceful woman, determined to make her own way after a disastrous marriage. She’s an interesting character and I think there is definitely more to see here. Throughout the book, Frances struggles to figure out how she will make ends meet now that her father‘s investments have failed. Not having those resources to fall back on means she will need energy source of income. One suggestion is that she bring out other American debutantes for a London season. This, I think, will create an opportunity for plenty of interesting situations and I am looking forward to the series. Reviewed for LnkToMi iRead in response to a complimentary copy of the book provided by the publisher in hopes of an honest review.